The theme of Australian-specific subject matter has been a constant in Paradise Motel's music and for that alone they qualify as a rarity. To my ears they are suitable carriers of the torch left once The Triffids expired as a band, especially on this new album - their first in eleven years. 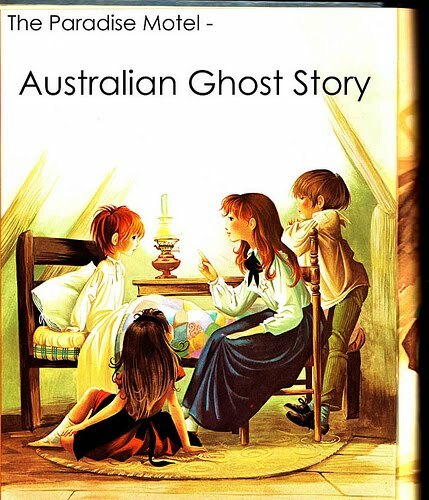 In the case of Australian Ghost Story, that torch highlights the dark tale of baby Azaria's mysterious death at the start of the '80s, and the subsequent trial by media - the first of its kind in this country - of the one-time accused woman at the centre of the story, Lindy Chamberlain. The story of Azaria Chamberlain's death has been told and re-told to the point of fictionalising and wild assumption; perfect fodder for a songwriter, which in The Paradise Motel's case has been generously applied. The band have lyrically always offered fragments of often menacing stories and scenarios of nameless characters, but with their new album set for release on the 30th anniversary of the Azaria's death, the subject of the stories has a name and the scenarios are documented. Really though, menacing is hardly broad enough a term for what is on offer here. Each track's narration jumps from reflection to mythologising to accusation incorporating the viewpoints of all the stories mainplayers, including the unique environment of the Red Centre. On opening track The Witnesses, it isn't apparent who the narrator, vocalist Merida Sussex, is voicing until the line 'my wife tracked the footsteps/we found her guilty' and the listener is suddenly reminded of Lindy's tragedy at having her husband turn on her during the trial. The song quietly berates the witness testimony's given credence at the time, yet avoids dwelling in heroes and villains territory as might be expected. Chamberlain's trial is touched on during a couple of the songs, but it's the descriptions of the landscape and its role in the Chamberlian case, and when Merida gives a voice to Lindy that really draw you in. A Bend In The Terror for example sees the mother telling her deceased daughter 'now she is free', all the while reassuring herself and questioning her memory of the events, maybe even imbibing them so as not to forget the short time in which Azaria was alive. The imagined letter from Lindy to Azaria, Stations Of The Cross is kind of half spiritual babbling mixed with intruding cold reality, making for an engrossing finale to the band's rendering of this story. Musically Paradise Motel are swimming in familiar waters, they go between bare accompaniment and sweeping orchestral numbers, all while Merida's voice remains a central steady pace and pitch. Perhaps because of the subject matter, the band have gone for a more soundtrack-ish approach to the music. The string laden tunes are memorable but not distracting from the tales being told in the detached way in which Sussex sings. The mood with which the band tells this now legendary story is at odds with such familiar things as the tragic-comical news footage often wheeled out showing Chamberlain's famous dingo remark. They instead choose to highlight things such as Lindy's deeply religious beliefs at the time of Azaria's death and the betrayal she felt by her husband and country. The Paradise Motel have written a concept album devoid of obvious romanticising about actual events, instead they present an impressionist, cloudy observation as would happen with a familiar story after many years of being retold. I for one am overjoyed that The Paradise Motel have decided to record again after such a long break, and to tackle this particular subject makes their return all the more delicious. At a time in Australia when junk media trialing saturates prime-time TV, it's all the more important that this story and it's consequences for one Australian family are remembered. The legacy of Azaria Chamberlain's death has been a plethora of artistic statements; from the Meryl Streep film (Evil Angels), to countless paintings, and that bizarre opera to name a few. 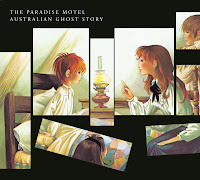 Australian Ghost Story is a fine continuation of that tradition and a very welcome return of The Paradise Motel. Hi Lauren, thanks! I really dug your comments on Pavement's show, I have to agree - they were boring to watch and not anywhere near what I was expecting. But re. Paradise Motel, I'd love the artwork jpegs - I could only find the flyer online. Much appreciated!